In this poetic dialogue, Gajaka toured the aliases he used over his lifetime, his poems, that silent encounter with his friend, Ricardo Leon Peña, one winter night in a shared space on the Lower East Side, where they decided to write to each other instead of talking. In addition to his own poems, Otoniel Guevara shared the poems of other Salvadorian authors so they could be part of the conversation in spirit. Highlights of this lyrical evening were the interpretation of an old and sensual memory pulled from Guevara’s past that was inspired by an old flame. A poem by Caro responded to this romantic exchange. Actors Adriana Hernandez and Ramiro Sandoval gave life to these poems. Gabriel Jaime Caro (Gajaka) is a poet, editor, writer, film chronicler that was born in Medellin, Colombia in 1950. He is co-founder of various literary magazines like “Siglotica,” “Cine y debates (Cinema and discussions),” “Realidad Aparte (Separated Reality)” and “Crucimes in USA.” His poetry is attributed to the Latin American neo-Baroque style by his hermetic language expression. In Colombia and New York, this movement is redefined as “neoberraco” with a deeply ironic, yet humorous and acidic bias. 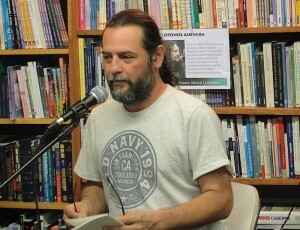 Otoniel Guevara is a poet and journalist born in Resume, El Salvador in 1967. 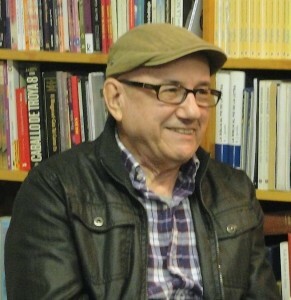 Since 1984, he has participated in national and international writing competitions, including that of the 1999 International Poetry Festival of Medellin. He was also part of the guerrilla ranks of the Farabundo Marti National Liberation Front during the Salvadoran Civil War, a period in which he also founded the Literary Workshop Xibalbá. He studied journalism at the University of El Salvador and under his direction developed the cultural supplement “Tres Mil (Three Thousand)” for the Salvadorian newspaper, Diario Co Latino.